Findata provides integrated planning solutions that ensure sustainable financial provision in real terms, incorporating individual and corporate solutions that are optimized for income tax, estate duty and capital gain liabilities. Effective financial planning requires a multi-disciplined approach. The planning process must take into account the individual and family's needs, remuneration, tax , investment preference and risk profile, asset accumulation and estate duty. Solutions must compose of the optimal combination with the best after-tax outcome with regards to income, estate and capital gains tax. Quantifying the identified specific needs of the client. Evaluating all the solution variables for the identified need. Implementing the best fit solution. No single solution can be seen in isolation. It is essential to ensure that none of the related and interlinked disciplines are compromised. 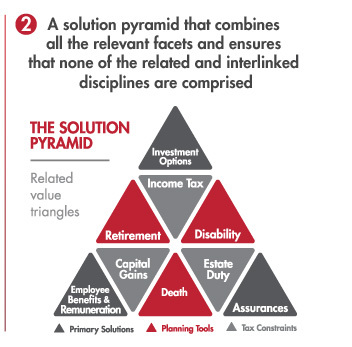 Every financial planning action will impact on a variety of related disciplines. Finding the best mix and fit will ultimately determine the success of the overall financial structure. 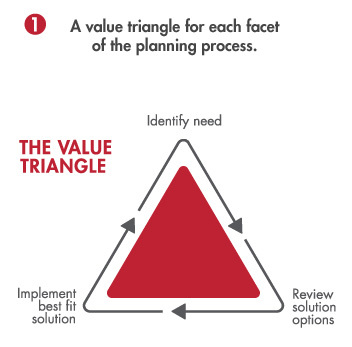 It is essential to combine the value triangles of all the related facets to ensure that the planning is a strong, integrated holistic solution. 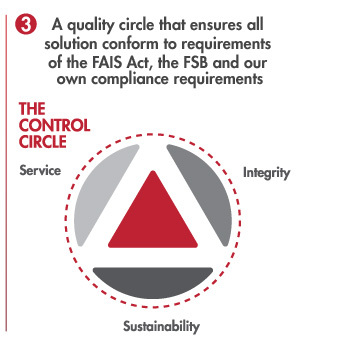 The quality circle ensures that all solutions conforms to the requirements of the FAIS Act, the FSB and our own compliance requirements. The circle ensures that clients make an informed decision on solutions, which must be reasonable and equitable, with full disclosure of all costs and the latest fund facts. The ongoing research and development of Findata's and Finsolnet's planning strategies ensure that clients can make informed decisions on accurate and qualified data. All our planning, whether for death, disability or retirement, models the real value of the provision or investments over time, taking into account present value of available capital, additional contributions and withdrawals. Ensure that planning is integrated, comprehensive and sustainable. Incorporate all aspects that have a financial impact on planning for death, disability and retirement. Develop a comprehensive needs analysis with active solution comparisons that are regularly reviewed and updated. Utilise the full spectrum of planning tools, investments, assurances and employee benefits to optimise the solutions offered. It illustrates the financial results achieved if the capital is invested, assuming a real return of 2%, 4% and 6% as well as the total return expectation of the actual asset allocation. The model determines the mix of these investment strategies that best match the risk/return expectations of the client. Any income withdrawal can be adjusted to illustrate the influence of bigger or smaller withdrawals on sustainability. The planning accepts that income withdrawal from the investment grows with inflation. Other variables, such as contributions and retirement age can also be adjusted to analyse the influence on sustainability. Medical aid contributions that rise above inflation are handled separately. The use of equities as growth assets is fundamental in Findata’s planning. 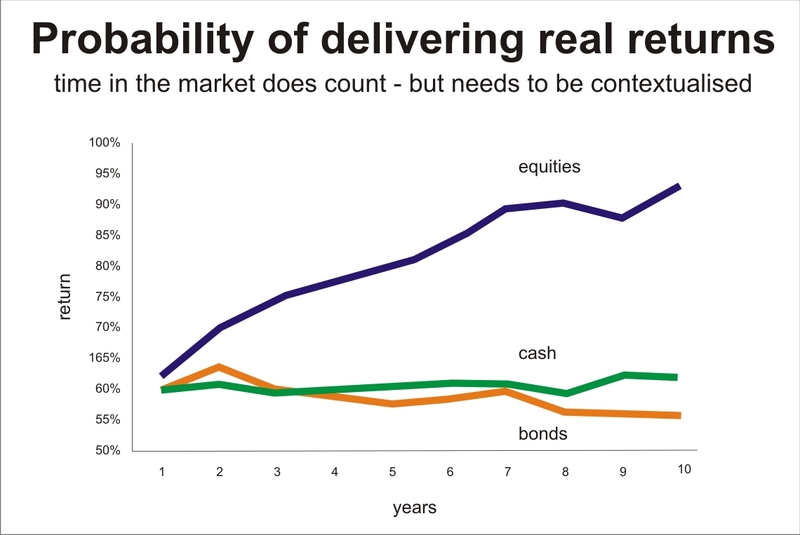 Real returns are virtually impossible without exposure to equities. 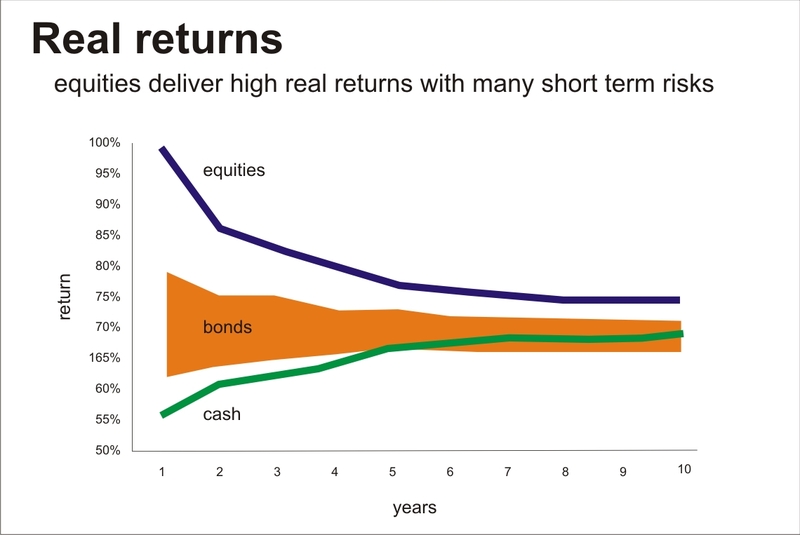 As illustrated below equities offer the highest probability of real returns in comparison with cash and bonds. However equities are volatile. This volatility is reduced over time. The higher the return expectation, the greater the required equity exposure and the longer the investment term to reduce the consequential volatility risk. Equity risk is not the risk of losing capital, but rather volatility. Time is thus the key component required to manage volatility risk. Findata uses the real investment return strategies of Finsolnet to manage the benefit and risk of equities over the short, medium, and long term. These strategies have a proven record of more than 10 years. 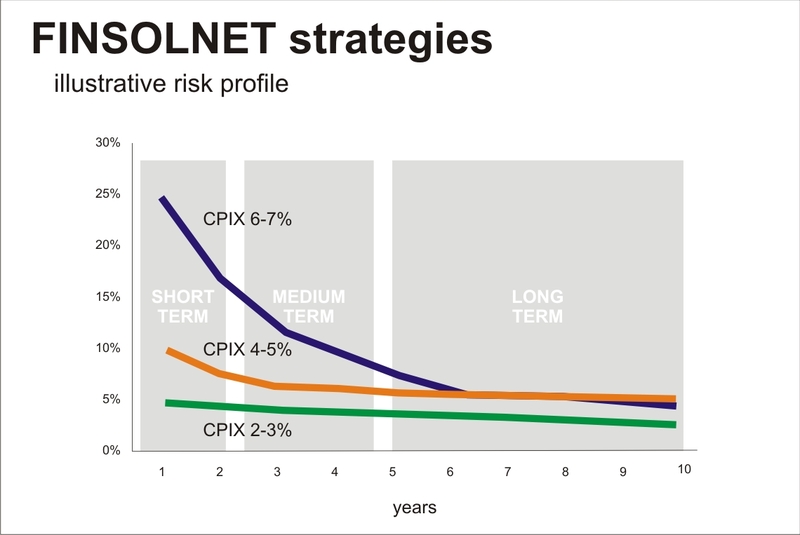 The Finsolnet strategies differentiate return, risk and time. Investors must, however, accept the investment philosophy of Findata. Clients must understand and accept the use of equities as growth assets. The client is actively involved in determining his risk profile and investment horizon and the optimal asset allocation between long, medium and short-term strategies. South African individual investors are allowed to invest up to R10 million per year anywhere in the world. We consider offshore diversification integral to long-term wealth creation and offer a range of investment funds across all asset classes. Many of the these investment companies are not present in South Africa and the only way to invest in some of the best-performing funds in the world is by making use of the foreign investment allowance. Applying for foreign exchange clearance via SARS and the SA Reserve Bank. Arrange for the placement of the cleared funds with one of the investment platforms we use. Setting up of offshore trusts, foreign bank accounts and other related services. We also makes use of local asset- swap investment portfolios for investors and entities who do not wish to make use of the foreign exchange allowance. Tax is closely related to investments and personal finance. We therefore added a tax- advisory service to the service offering of Findata through our network of associates. Through our associates Findata offers its clients assistance with the drawing up and safekeeping of wills, estate planning and the winding up of deceased estates. We also assist clients with establishing local and offshore trusts. Life insurance: Findata offers an independent insurance broking service. We source the best possible quotes from various insurance companies to ensure the client receives the most suitable product for his/her individual requirements. Medical schemes and gap cover: Solutions are provided independently and objectively with the biggest solvent medical aids and providers of GAP cover to ensure shortfalls can be met in the event of a hospital or specialist charging higher than the tariff rates. Findata assist employers to set up and manage group risk and retirement schemes for their local and international employees.